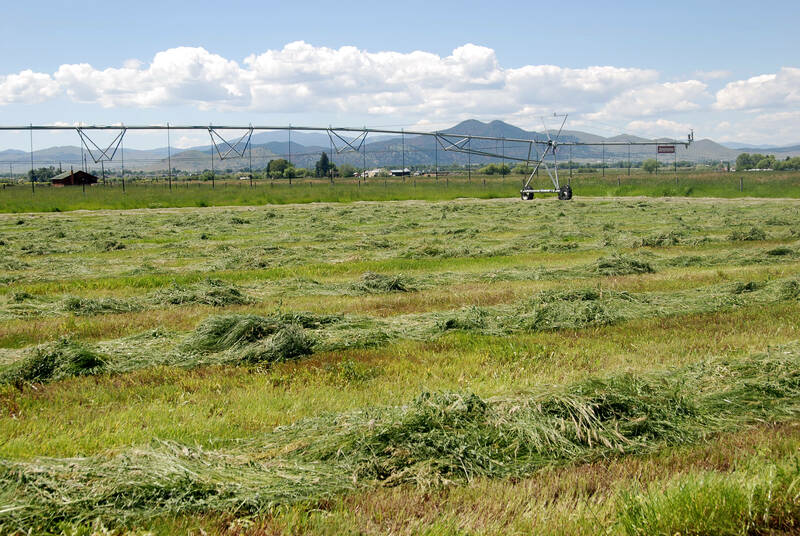 The well-located Helena Valley Hay Farm, comprised of about 300 contiguous and deeded acres, produces 3.50 to 4.00 tons of alfalfa hay per acre annually. One of the last good-sized tracts of Montana farm land for sale is a pristine piece of real estate in the growing area between Helena and Lake Hauser, the Farm is competitively priced at $3,500 an acre and will provide its next owner the options of farming a productive parcel of irrigated land or, in time, creating several smaller parcels for resale. 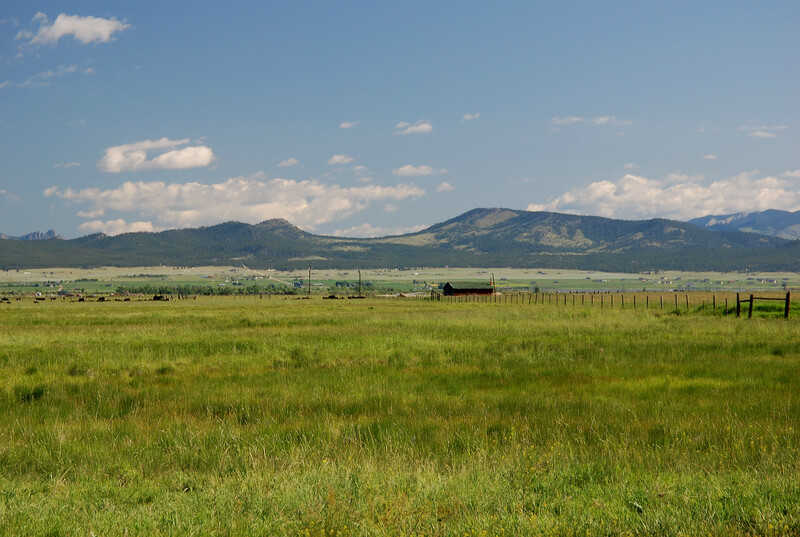 Complete with solid decreed irrigation water rights out of Prickly Pear Creek plus a Bureau of Reclamation water allotment out of Canyon Ferry Reservoir, this Montana farm which is being offered for sale is one of the finest parcels in the Helena Valley. It is productive and attractively priced for either gentlemen farmers or existing operators looking to safely expand. 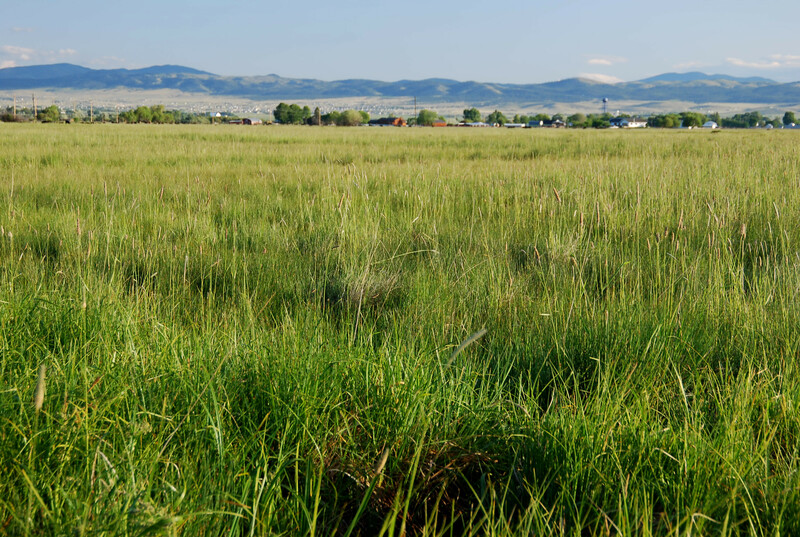 Helena Valley Hay Farm’s strategic location near Montana’s growing Capitol City ensures a sound investment in land and water rights that won’t melt away in future years. 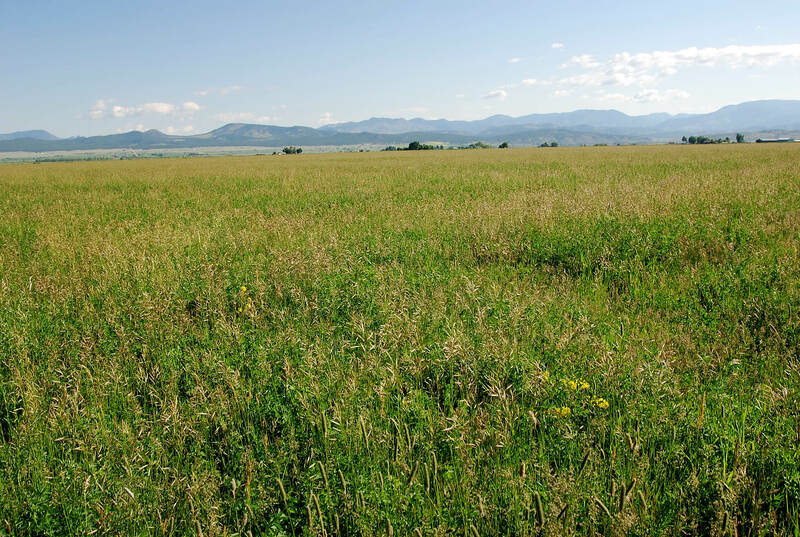 Located just two miles north of Montana’s capital city, Helena, the Helena Valley Hay Farm enjoys city amenities while providing a sense of solitude that rural Montana offers. The Farm is positioned along Floweree Road north of York Road, an east-west artery between Helena and HauserLake in Lewis and ClarkCounty. The Farm is accessible by taking York Road east from Helena and north on Floweree Road approximately one-half mile via a well-maintained, paved county road. Floweree Road provides the west boundary of the Farm. The Helena Valley Hay Farm enjoys easy access to HelenaRegionalAirport located just south of the Farm about one mile. Commercial carriers include Delta-Sky West, Northwest-Pinnacle Airlines, Big Sky and Horizon Airlines. 100 Acres of Sub-Irrigated Pasture. 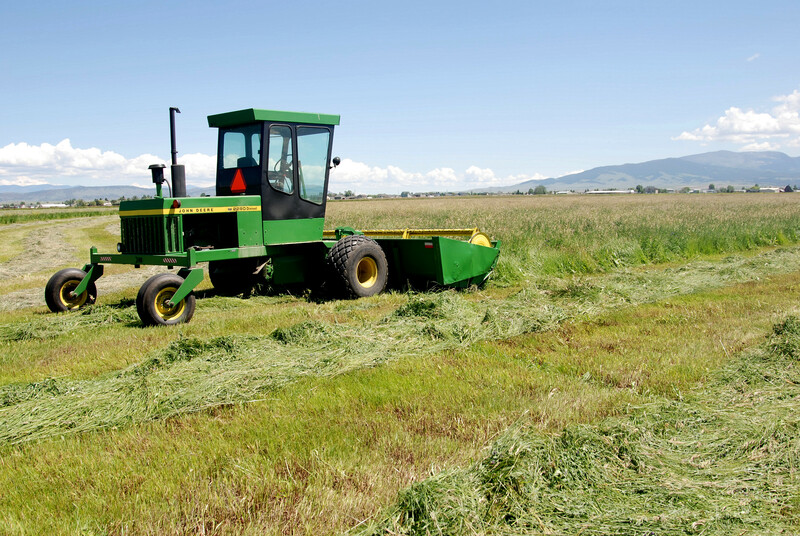 The irrigated crop land under the Zimmatic center pivot and wheel lines has historically produced between 3.50 and 4.00 tons of alfalfa hay annually from two cuttings. The Farm’s appurtenant water rights are from Canyon Ferry Reservoir and Prickly Pear Creek. The Farm has historically served as the hay base for about 150 to 180 head of mother cows which also graze the land during the fall and winter. The soil is tested regularly to ensure the annual application of fertilizer is properly formulated. Typically this formula is a combination of nitrogen, potash, phosphorus, zinc and copper, with the alfalfa ground demanding a higher concentration of phosphorus. Annual fertilizer cost is approximately $30.00 per acre. The value and productivity of Western farms is tied to their associated water rights. 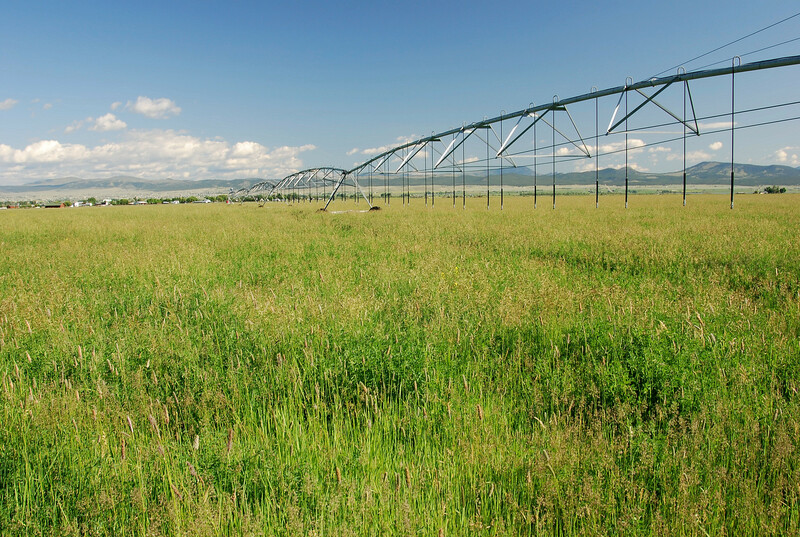 The Helena Valley Hay Farm has early water rights on a well managed resource in Canyon Ferry Reservoir and Prickly Pear Creek and it has the quantity of water to ensure a solid irrigating season and quality crops. The center pivot and wheel lines are in good repair and have been meticulously maintained. The Zimmatic center pivot was installed in 2001 and has about 6,000 operating hours. It is served by a Crown Turbine pump and 20 HP motor. The two wheel-line systems are approximately 7/16 of a mile in length and are served by a Gouldspump powered by a 25 HP motor. Comfortable day time highs in July and August average 83 degrees with evenings cooling to around 52 degrees Fahrenheit. The coldest months are December and January with daytime highs around 31 degrees and evening temperatures averaging 11 degrees. The wettest month is typically June with an average precipitation of 1.82 inches. Annual precipitation averages 11.32 inches. The City of Helena sits at an elevation of 4,347 feet above sea level. The Sellers will convey the Farm without reservation of whatever mineral, oil, gas, geo-thermal, hydro-carbon and gravel rights which he actually owns, subject to reservations by previous owners. The Sellers make no representation as to the quantity or quality of any mineral or other subsurface rights appurtenant to the Farm. Electricity is provided by NorthWestern Energy. Telephone service is provided by Qwest. During irrigation season, the electrical pumping cost is approximately $800.00 per month. The real estate taxes for 2009 were approximately $1,300.00. The Helena area is rich with intriguing history. Dotted with many small towns created in the fervor of the gold rush, each offers colorful stories of the past. One nearby “almost” ghost town, Marysville, was discovered in 1876 by Irishman Thomas Cruse. Cruse discovered a mining vein and named it after his home town of Drumlummon in Ireland. He then named the town after the first woman to arrive, Mary Ralston. From 1880 to 1890, Marysville was Montana’s leading gold producer and had a population of 3,000 people. Total production from Drumlummon is estimated at $50,000,000. Tommy Cruse sold his lucrative mine for $1,500,000 to an English syndicate and moved to Helena and helped to build the magnificent cathedral and established a profitable bank. Helena was inadvertently founded by four Georgia men, known in the history books as the “Four Georgians”. John Cowan, Daniel Jackson Miller, John Crab and Robert Stanley became desperate after searching throughout Western Montana for gold. Unable to find their “jackpot”, they stumbled into the area now known as Helena. On the evening of July 14, 1864, the men took one last chance at mining the nearby creek. As luck would have it, the men found gold that evening. They named the stream, appropriately enough, Last Chance Gulch. Word soon got out about the gold strike and Helena became the “QueenCity of the Rockies”. The Four Georgians worked the Gulch until 1867 when they headed back East, taking large amounts of gold with them. The Museum of Gold at Norwest Bank displays gold nuggets as large as 244 ounces. Known for sapphires as well as gold, it is estimated that in 1888 as many as 50 millionaires called Helena home. 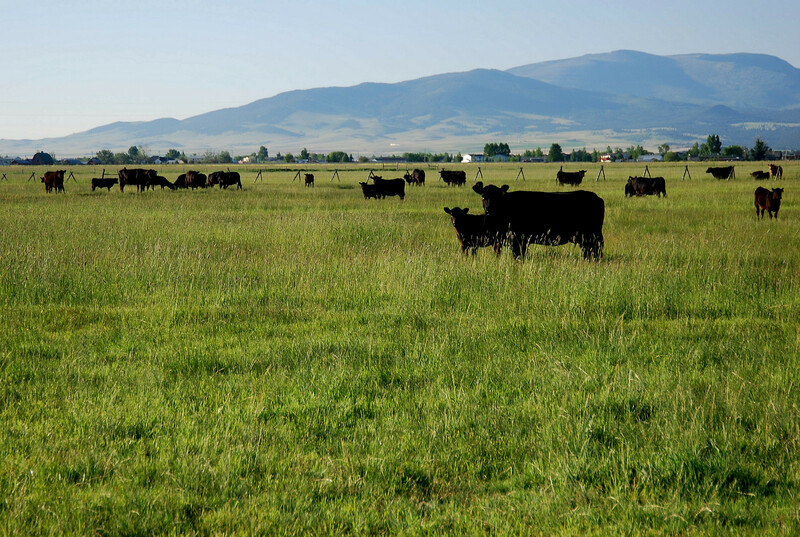 The Helena Valley Hay Farm enjoys both a premier and convenient location in the Helena Valley – one of the Big Sky State’s more desirable locales. The Farm is productive and well-priced for either a gentleman farmer or an existing operator in the Helena Valley looking to expand their current operation with a well irrigated and conveniently located parcel. The Farm is strategically located in the Helena Valley and should provide a nice return on investment in future years. There are numerous beautiful sites for construction of a new home and working facilities for horses and/or cattle, if the next owner so chooses. This unique farm, containing about 300 acres of land, has great potential for either the placement of a conservation easement should this concept appeal to the next fortunate owner, tasteful development or production. The attractive nature of the Helena Valley Hay Farm provides a variety of viable options for the next owner. The Seller reserves the right to affect a tax-deferred exchange for other real property in accordance with provisions in Section 1031 of the Internal Revenue Code. The purchaser will not be required to incur any additional expenses nor to step into the chain of title on any property which the Seller may acquire.